On the basis of the results of the work of the monitoring group, by the Patriarchal Pilgrimage Center of the UGCC, in the near future pilgrimage routes will be developed and catalogued. And thus a web-resource will be created, and the mentioned publishing projects – a map, catalogue, booklets, and guidebooks – will be produced for every pilgrimage place. As was foreseen in the presentation of the center, which was held in December of last year at the Synod of the UGCC, the Patriarchal Pilgrimage Center plans to prepare these products by April. It is expected that by June of this year the program of pilgrimage will be ready. 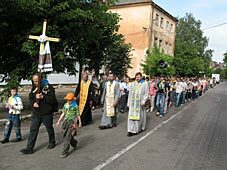 The Patriarchal Pilgrimage Center of the UGCC (FPC) of the Patriarchal Curia of the UGCC was created on May 8, 2009, by the Decree of Major Archbishop of Kyiv-Halych His Beatitude Lubomyr, considering the initiative of Patriarchal Society of Equal-to-the-Apostles Grand Prince Volodymyr to better organize pilgrimage activity of the UGCC and to provide the spiritual needs of pilgrims.